There’s no doubt about it. Australia is an incredible place. When we saw we could travel to Australia on Working Holiday Visas in 2014, we jumped at the chance. Australia is a massive nation that compares pretty closely to the size of the continental US. Setting off on our campervan road trip, we knew the distances would be far and the hours would be long. 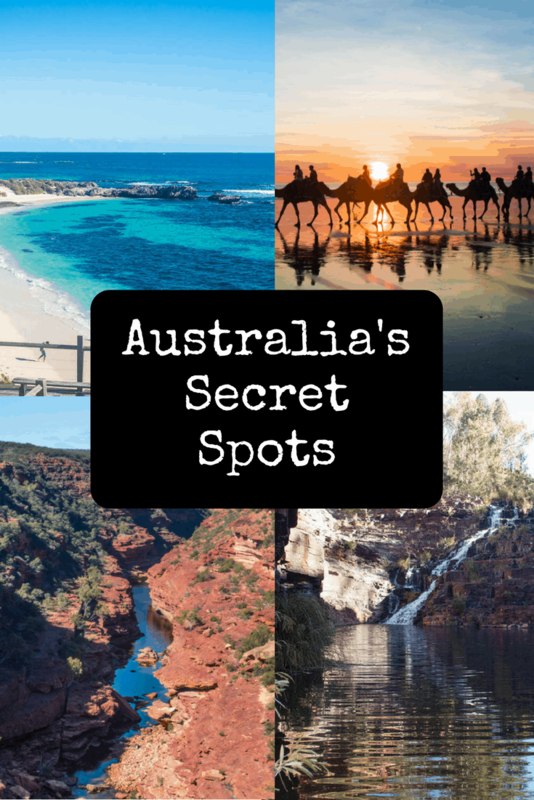 What we didn’t know is that the route we chose would introduce us to some of the best hidden gems in Australia, it’s lesser-known but truly amazing spots. After you’ve experienced all the great things to do in Perth, head about 45 minutes off the coast to a gorgeous tiny island known as Rottnest. [ Pssst: Pre-book your ferry ticket here to save time!] 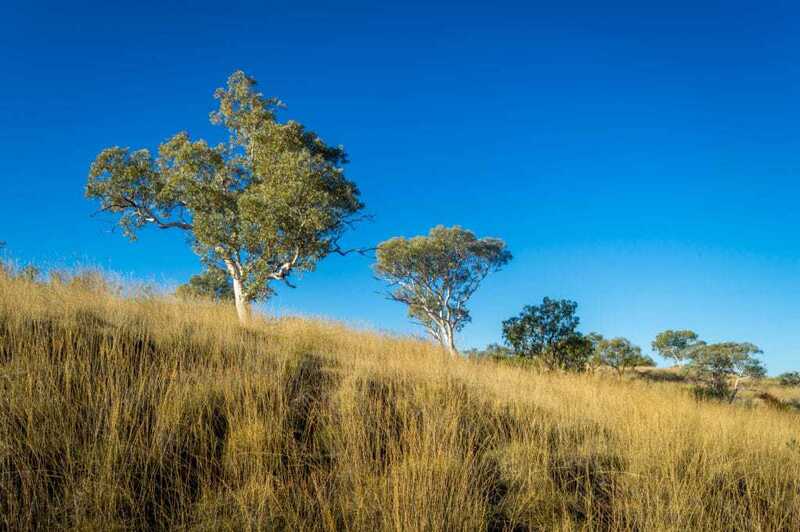 Although quite popular with travelers and locals in that region, many tourists never make it there, and it’s definitely one of the hidden gems in Australia. It’s a bit off the beaten path (as is all of WA). But Rottnest is stunning. The water, as shown in the photo below, is absolutely pristine. There are many places to walk around the island, but biking is ideal. Want more beach time? 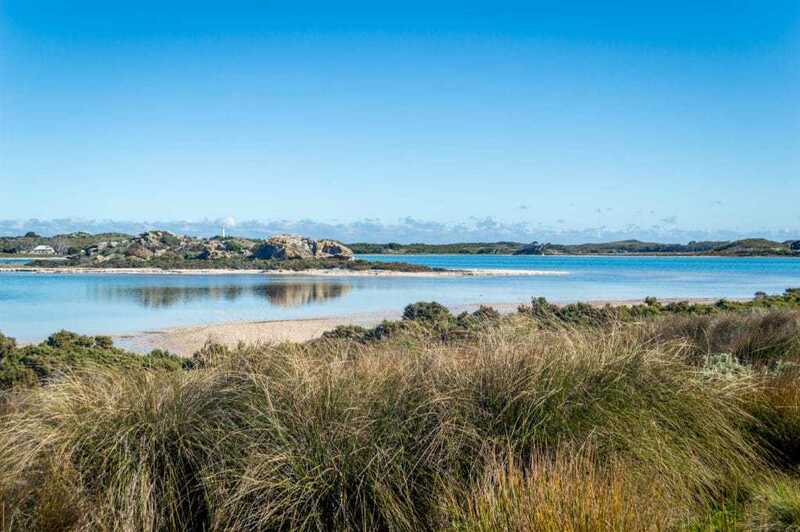 Check out this list of Australia’s best beaches. The best part about Rottnest? It’s filled with furry little animals called quokkas that peer at you curiously. How can you resist their adorable faces?! The island’s name is based on the quokka. Apparently the Dutch thought they were giant rodents, and the island became known as rat’s nest or Rottnest. Of the many things to do (and not to do (and not to do) in Australia, we tried to cross most off our bucket list. But we also wanted to find the more “off-the-beaten path” destinations. A lot of visitors to Australia make it to Uluru, Darwin, and Kakadu, but not as many visit Katherine. In the far north, Katherine is a pleasant settlement after driving for miles of semi-desert landscape. 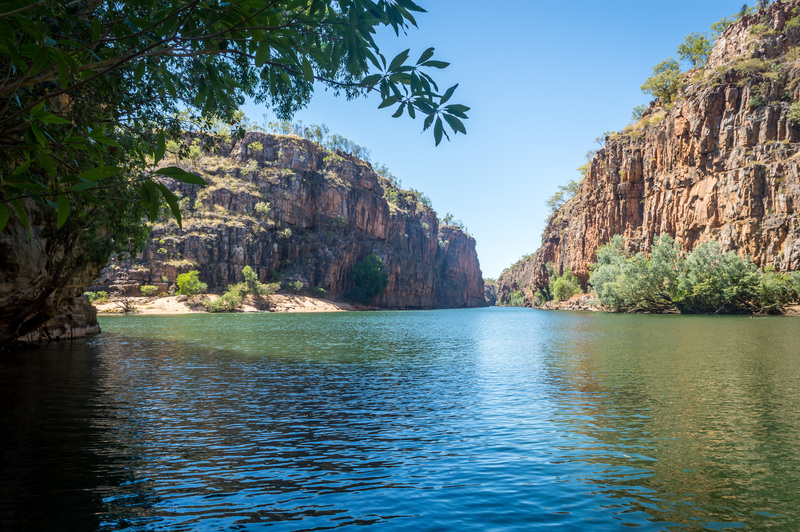 We had a great time in Katherine, exploring museums, hiking, and visiting the gorges in the Nitmiluk National Park. We felt as though we’d stumbled across a rare treasure: perhaps another of the hidden gems in Australia? The photo below is of the awesome Butterfly Gorge. The northern parts of Australia are infamous for containing a deadly and aggressive animal, the saltwater crocodile. In nearly every body of water in the upper parts of WA, NT, and QLD, you should be alert for the presence of “salties” as they’re called. They are found in both salt and freshwater. If they are known to be in the area, there will always be an abundance of signs warning you of their presence. You don’t want to mess with salties. It’s very hot up in the tropical north of Australia, however, so cooling off is a necessity, even in the winter, which is when we were there. Fortunately, this area, Butterfly Gorge is reputed to be crocodile free (* in the dry season). We took a refreshing dip in this beautiful gorge after a long and strenuous hike. 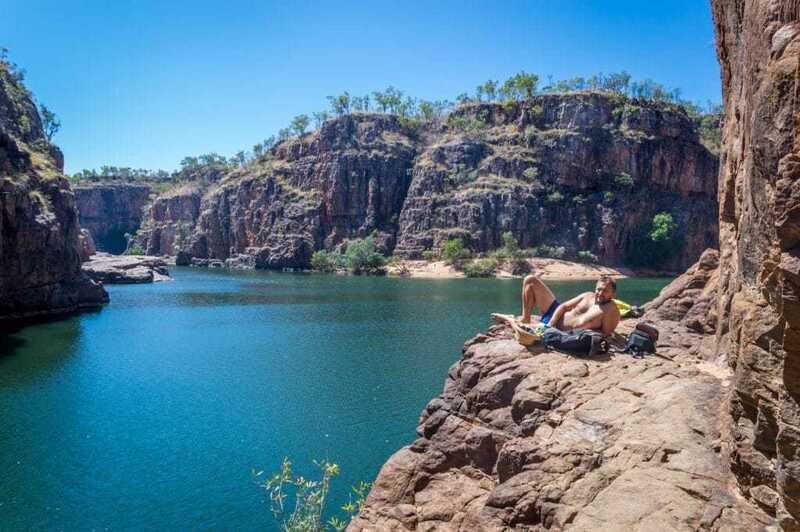 Please note, according to our later research, we’ve been informed that Katherine Gorge is NOT crocodile free year round. In fact, at any time of year, there is the potential for the presence of crocodiles. Always check with rangers before swimming, and definitely adhere to signs posted at any watering hole in the upper NT, WA, or QLD. We then climbed up to this vantage point and dried ourselves in the sun. As we sat, a boat tour of the gorges came by and we waved at them. We overheard the guide tell the passengers they were lucky enough to see a rare sighting of backpackers in the wild! HA! Certainly one of the top things to do in Australia is to visit one (or several) of its stunning national parks. 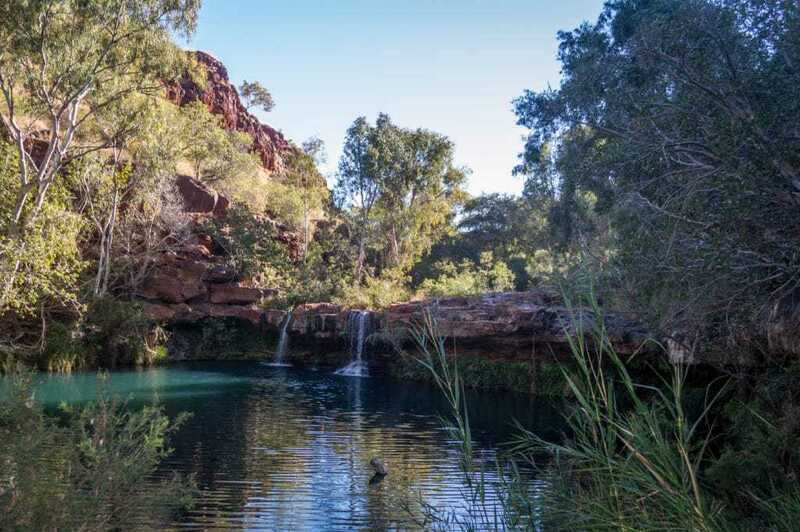 A lesser-known Australian national park is Karijini, tucked into a remote part of Western Australia. We went there and camped for a few days and were not disappointed. Karijini is HUGE and unfortunately, you need a 4WD vehicle to see most things. We’ve mentioned before that a 4WD is a great asset on an Australian roadtrip, but we were in a mere 2WD campervan. Still, our hike was awesome, and we were rewarded with this magical swimming spot and a few waterfalls at the end. First was the impressive Fortescue Falls, and then the serene Fern Pool, as seen below. 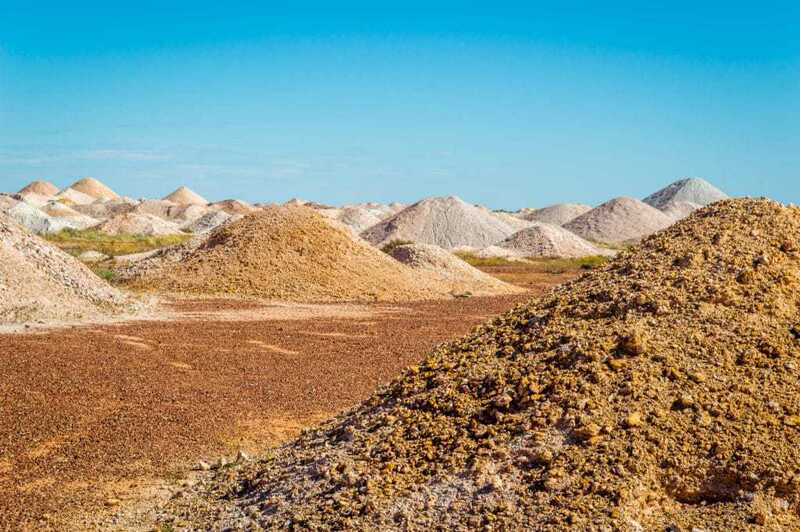 One of the most incredible places on our journey, if not the most beautiful, was the fascinating opal mining town of Coober Pedy, set in the center of the South Australian desert. It’s unbelievably hot here, so most residents have built their homes and businesses underground to stay cool throughout the year. Tourism may be a small part of the local economy, but the rest of it comes from the lucrative opal mining business. We visited an old mining site, learned about opals, and explored the crazy scenery around town. We also stepped into a cool and cavernous underground church. When seeking hidden gems in Australia, this place might just top the list. 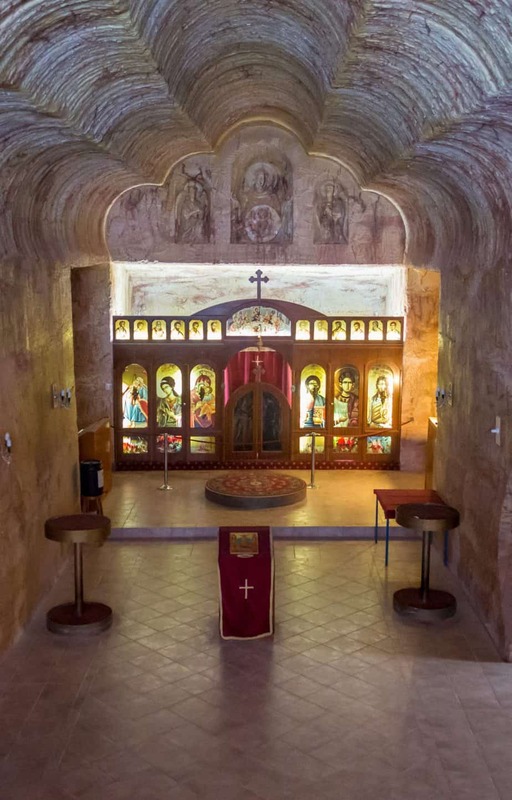 Our friend Claire has a post on some of the other cool things to do in Coober Pedy. There are countless amazing places to visit in Australia. But don’t just see the Great Barrier Reef and the Sydney Opera House. Step off the beaten path and find something extra unique and special, if you can. We are chagrined that we didn’t see much of the east coast, to be sure. Next time, we might consider an East Coast Australia package to see even more. To spend a longer time in Australia, considering looking into the magic of a working holiday visa, the perfect starting point for extended travels. 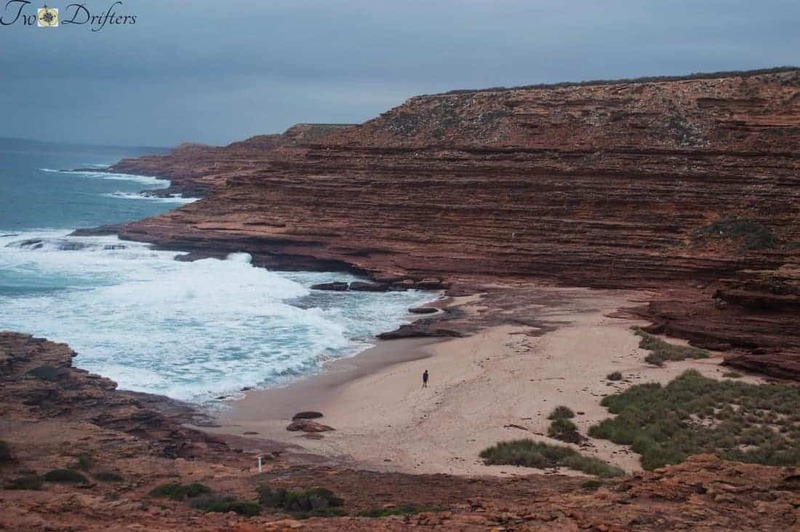 Hands down, one of our favorite discoveries in all of Australia was Kalbarri National Park. You may have seen photos of the famed “Nature’s Window” found on the interior national park. This area is filled with awesome hiking trails, scenic vistas, and a lovely desert-like environment. It’s really cool and definitely worth going to. But the coastal cliffs really surprised us. These are a part of the same national park, but set against the ocean, these towering limestone structures are awe-inspiring. 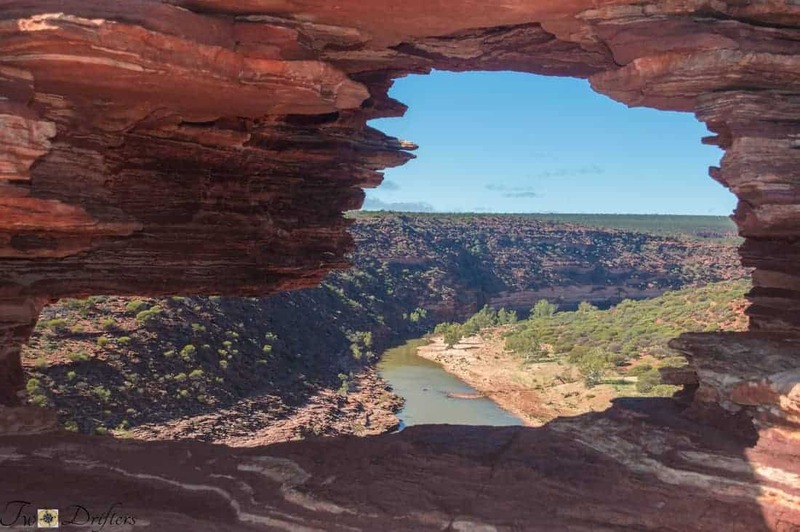 We recommend taking a few days to make the most of both parts of the Kalbarri National Park. 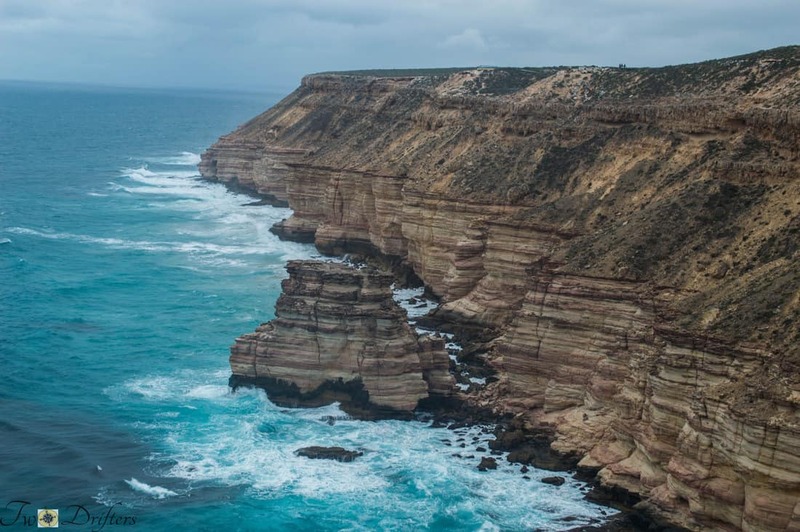 The Kalbarri Coastal Cliffs – Wow! Ok, so Adelaide is not exactly a hidden gem, but we really fell head over heels for this smaller city. Sure, Melbourne and Sydney get all the attention, but Adelaide, was clean, friendly, and a lot of fun. We stayed in a nice hostel in the city centre and had a great time just walking around and exploring. We ended up chilling out at an open mic comedy show, and it was really funny! We’re also fans of a good latte, so we made sure to get coffee in Adelaide, of course. What’s your favorite hidden gem in Australia? We also personally recommend these travel essentials for any trip: a convenient hanging toiletry bag, a portable power bank to keep your devices fully-charged on the go, and a set of packing cubes to take your organization to the next level. If you’re backpacking in Australia, you might want to take a look at our list of best backpacks for travel. Have you been to Australia? Tell us about your favorite place in the comments. Enjoyed what you read? Pin it for later! All gorgeous spots you chose! So many places to choose from in Aus though, I don’t know if I could write them all down! haha. There truly are endless incredible places in Aus!! I gotta get to Australia some day. Looks so amazing! ahh it is! It is a long flight tho 🙂 Where are you currently? Some of my own faves there too 😀 Congrats on getting off the beaten track – it’s SO rewarding! I actually started my own blog because one of my (Aussie) friends told me she’d been to the Gold Coast (Movie World, Sea World etc), Sydney, Alice Springs and the snow at Mt Hotham so she’d ‘done’ Australia!! It’s actually better for travellers to think of OZ as about 10 or 15 different countries – that way you don’t try to do everything in one trip. Thanks! totally agree. in fact, we never even made it to the Gold Coast or Queensland. I am a bit disappointed we didnt see the Whitsundays, but we saw soooo much…really we ran out of money! lol. Alice Springs was an awesome town tho! Make sure you come back to see Queensland – you can always couch surf with us. 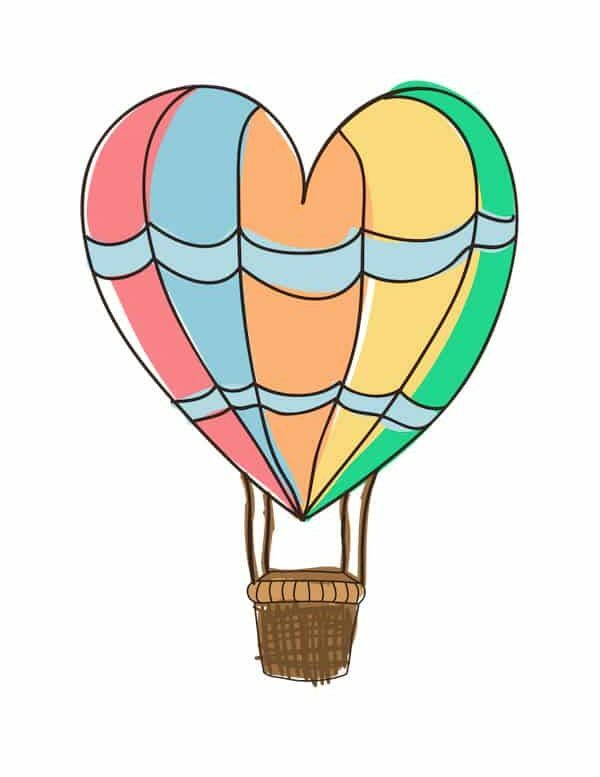 Check out our blog – its pretty new but we’re adding things we like in Aus, and further afield, to it. Love your selection! I still haven’t made it to Rottnest Island, as the only time I visited Perth it was June and rather rainy most days. Will have to add it to my list, thanks! 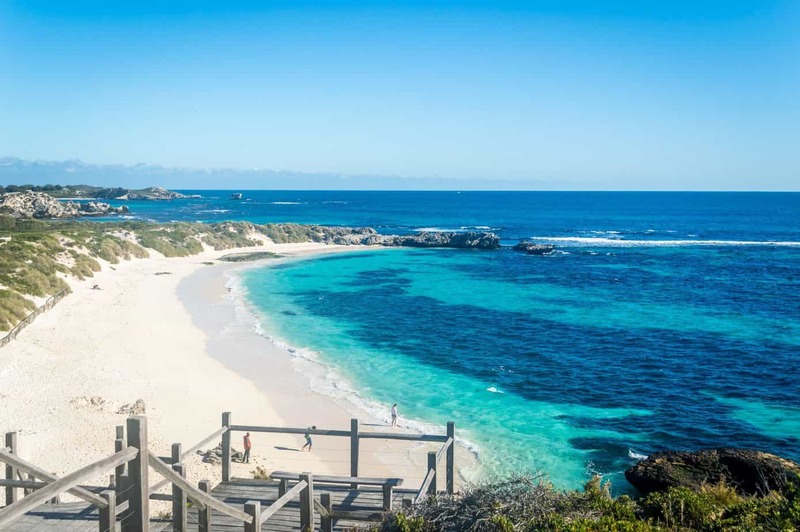 yes, Rottnest is great! I wish we’d spent more time there, tho. You really need to have a bike to see most of the island, or pay for the bus service. I’ve been wanting to visit Australia for so long! I loved reading all of your helpful insights to discover places that are usually overlooked. I’ll definitely keep this in reference for a future trip! aweseome! I hope you get to go! The only thing we really regret not seeing was the Whitsundays. next time! I loved Kangaroo Island! So much to see and explore. Rottnest was awesome too as was Kakadu. Can’t wait to go back!! oh I know, we can’t wait to get back too! Loved your post and I totally adore Australia, the West is gorgeous. We loved Coral Bay, go kayaking and snorkel to see great wildlife! And Wilson Prom in the south near Melbourne is a surprise. Katherine was fantastic and do not forget Fraser Island….oh, I would love to go back to Australia and find new places. Just remember Katherine Gorge is NOT crocodile free all year. Always check with the rangers. Thank you Karen! I’m going to amend the post to note this. It’s been a few years, so I’m sure we must have checked to make sure it was alright at the time (and it was dry season), but in researching now, I feel quite frightened at the possibility of the risk we took!! So scary!! Cooper Pedy is such a weird & wonderful place. Our first night there we camped outside & froze in -5 Celcius, next night we camped underground & was wearing t-shirt & shorts! The Rottnest Quokka’s are so cool. I spent 5 weeks there and I still have soon much to learn and see! it’s such a huge country! We never made it to QLD or TAS unfortunately. Next time! As a Queenslander, you have to visit my home state. I love south-west WA and TAS too. I have to admit that I have yet to see most of what you have seen. We Aussies tend to travel overseas and marvel at the old architecture etc available in Europe or America rather than seeing our home country. The Sunshine Coast, just north of Brisbane, is great to visit, beautiful beaches. There’s plenty to do in Brisbane as well. Hmm, maybe it’s time I stayed home for a holiday! Great little article. I very much loved the west coast from Albany all the way to Coral Bay. The snorkeling and swimming with the whale sharks on Ningaloo reef was far better then most my trips to the Great Barrier reef. I haven’t made it to Karinjini though it and the Kimberly region are on my bucket list. The Daintree Rainforest in Queensland and Wilson’s Prom in Victoria. Love this! Will make sure to check out some of these places when I head over west next year. I’d add that there are a few under-visited places om the East Coast, like Coolangatta and Coff’s Harbour from personal experience, but also I’ve heard good things about Yamba, Bellingen and Ballina. Definitely worth exploring if you’ve got the time! those sounds good! I do some copywriting work for Aussie businesses so I’ve written about a couple of those places, Ballina, etc.. We sadly didn’t get to do much east coast exploring ourselves, but we did meets some friends in Jervis Bay, and the beaches there were really nice. Coffs and Yamba are both lovely. If you go to Coffs make sure to walk over to Mutton Bird Island it’s worth it. There are some excellent places that don’t tend to get a mention in the brochures. We lived there for 4 1/2 years in Newcastle district so saw quite a bit. Lake Macquarie is a stunning area. Loads of great walking cycling. and picnicking spots. You can camp on the beach at Blacksmiths, take 4x4s on the sands at Redhead Beach. Drive up the coast to Port Stephens and the gorgeous Nelson Bay for dolphin watching all year round and humpback whale watching from June to November.Also walk up Mount Tomaree for one of the top ten views in Australia . The other side of Sydney is the Southern Highlands, Kiama , with its ocean pool, Shell harbour are all lovely but for panoramic views go to the top of Saddleback Mountain, breathtaking views and we even saw a lyre bird on the way up. If you go to Byron Bay , Mullumbimby is close by and a cute town. For the hippies among us there is Nimbin too which is known for its alternative lifestyle. Where ever you go you are sure to find a top spot close by. Great info, Ann! Yes, there are soooo many amazing spots in Australia, you couldn’t see them all in a lifetime let alone one trip. I’m s glad we ended up seeing WA, but you’ve given us even more ideas for a future trip! All of these are on my list for “next time”!! My favourite place was Fraser Island, which is actually a staple on the backpacker circuit but not very well known outside of Australia, so I count it as a lesser known spot lol. ah cool! Is that in QLD? We didn’t get there unfortunately, but next time! that would be a whole trip in itself!